Van Halen is an American hard rock band formed in Pasadena, California, in 1972. From 1974 until 1985, the band consisted of guitarist Eddie Van Halen, vocalist David Lee Roth, drummer Alex Van Halen, and bassist Michael Anthony. 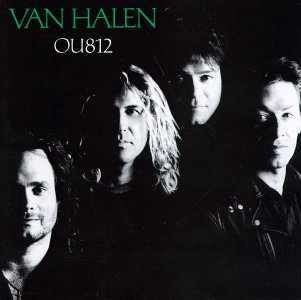 OU812 is the eighth studio album by American hard rock band Van Halen, released in 1988, and the second to feature vocalist Sammy Hagar. Van Halen started work on the album in September 1987 and completed it in April 1988, just one month before its release. Being a large-scale event with multiple acts, there was a long gap between many dates when the bands' gear was transported and set up. Members of Van Halen, and Metallica back stage during the Monsters of Rock Tour, 1988. Scorpions are a German rock band formed in 1965 in Hanover by Rudolf Schenker. Since the band's inception, its musical style has ranged from hard rock to heavy metal. The lineup from 1978–1992 was the most successful incarnation of the group, and included Klaus Meine (vocals), Rudolf Schenker, Matthias Jabs, Francis Buchholz, and Herman Rarebell (drums). The band's only constant member has been Schenker, although Meine has been the lead singer for all of Scorpions' studio albums, while Jabs has been a consistent member since 1979, and bassist Paweł Mąciwoda and drummer Mikkey Dee have been in the band since 2003 and 2016 respectively. Dokken is an American metal band formed in 1979. It split up in 1989 and reformed four years later. The band had many charting singles like and have sold more than 10 million albums worldwide. The live album Beast from the East was nominated for the inaugural Grammy Award for Best Metal Performance in 1989. The opening night of the tour in Alpine Valley was not without incident. The band Dokken had terrible sound and was subsequently booed for a lengthy amount of their set. The amphitheater at Alpine Valley had been recently sodded and before the Scorpions took the stage, fans had become impatient and started hurling chunks of the freshly laid sod into the air. Attendants came out and threatened to close down the venue. The scene calmed down and the show finished to thunderous applause. In San Francisco's Candlestick Park a stadium-wide food fight took place aimed solely at the upper deck. Unfortunately each band played only five minutes longer than the band before them. Kingdom Come played for only 15 minutes, and the show closed with Van Halen playing only 35 minutes. This was after Van Halen held a press conference at Universal Studios, while seated in front of a giant robotic King Kong – Eddie Van Halen stated “Five bands will be playing full sets”. In Tampa, a stadium-wide food fight took place. The show was general admission and the food fight took place between the concertgoers in the stadium stands and those on the field. Police around the perimeter of the field were being hit with bottles and garbage and eventually had to leave the stadium. The front field was so jammed with people they were starting to pass out and had to be passed to the front of the crowd and pushed over the rails to safety. They also had to spray the crowd at foot of the stage with firehoses to cool them. Dokken also had issues with their PA system, it was broadcasting on the same frequency as Tampa International Airport's tower. Tampa International Airport is an international airport six miles (9.7 km) west of Downtown Tampa, in Hillsborough County, Florida, United States. The airport is publicly owned by Hillsborough County Aviation Authority (HCAA). It has been praised for its architecture and Landside/Airside design of a central terminal (landside) connected by people movers to four satellite air terminals and gates (airsides), a pioneering concept when designed in the late 1960s. The airport was called Drew Field Municipal Airport until 1952. In Memphis, another food fight occurred between the audience in the stands and those on the field. Van Halen cut their set extremely short after Sammy Hagar's equipment malfunctioned. He called out to his guitar tech during the final song, "My axe be cutting out on me, Zeke." The concert was introduced by hostess Martha Quinn of MTV. In Kansas City, the food fight continued between the lower and upper levels of Arrowhead stadium. The Maine show was plagued by late afternoon moderate-to-severe thunderstorms & a near riot during a lengthy delay. The severe storm forced Dokken to play toward the rear of the stage to escape the torrential downpour / lightning. The storms caused a long delay post-Dokken's set, at which the crowd started chanting "Rain or Shine, Rain or Shine". As the crowd was getting more agitated, they were finally apprised of the situation (by a roadie or tour manager). However, the information was delivered in a very ill-advised way; arrogant, condescending, & taunting in nature to the point of the official saying "what?, do you think you're going to get your money back?" At this point the crowd started heaving chunks of the broken asphalt (which the people were standing on) at the tour official, as well as the equipment on stage & the situation nearly devolved into a full-blown riot. In New Jersey, a toilet was ripped from the wall causing a small flood on one side of the stadium. Between Dokken and the Scorpions, members of the crowd stole a case of frozen hot dogs from the back of the on-field concession stand and threw them into the audience. There was also a large food fight due to people getting fed up with the extremely long wait between the Scorpions and Van Halen. People from the upper decks threw food, drink and trash over the railing. At the same time, about one hundred or so people jumped the wall and rushed onto the main field which led to cheers erupting through the stadium. In Dallas, Van Halen's set was cut short by vocalist Sammy Hagar's voice problems. He promised Van Halen would return to Dallas and play a free show. The band made good on the promise three years later on December 4, 1991 with a free concert at Dallas Alley, a gentrified area on the northwest side of downtown Dallas where free concerts were often hosted to boost traffic for restaurants and stores in the adjacent collection of shops. This show also had a water/cup fight between the field and the stands at either end of a concession stand that was along the sidelines on the west side of the stadium. The Houston show also had a trash/food/water fight between the field and the stands. There was also a venue issue where a barrier broke and at least one person fell to a lower level of stands landing on lower seats. EMS was forced to eject several people. The show continued as scheduled. In Seattle the Scorpions' singer Klaus Meine was hit in the throat by a camera thrown out of the audience. He ranted about having respect for the bands on stage for about 5 minutes, then they did one more song and left the stage. This was about 3/4 into their full set. At Alpine Valley a lighting rig fell during the Scorpions' set, and Sammy Hagar fell off the stage. Michael Anthony is an American musician who is currently the bass player for the rock supergroup Chickenfoot and the Circle. Anthony was previously the bass player and background vocalist for Van Halen. 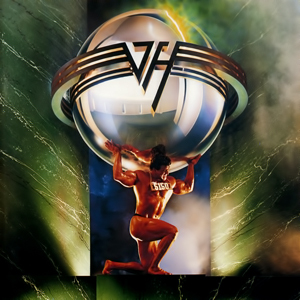 5150 is the seventh studio album by American hard rock band Van Halen, released on March 24, 1986 by Warner Bros. Records. It was the first of four albums to be recorded with new lead singer Sammy Hagar, who replaced David Lee Roth. Samuel Roy Hagar, also known as The Red Rocker, is an American rock vocalist, guitarist, songwriter, musician, and entrepreneur. Hagar came to prominence in the 1970s with the hard rock band Montrose. He afterwards launched a successful solo career, scoring an enduring hit in 1984 with "I Can't Drive 55". He enjoyed commercial success when he replaced David Lee Roth as the lead singer of Van Halen in 1985, but left the band in 1996. He returned to the band for a two-year reunion from 2003 to 2005. On March 12, 2007, Hagar was inducted into the Rock and Roll Hall of Fame as a member of Van Halen. His musical style primarily consists of hard rock and heavy metal. 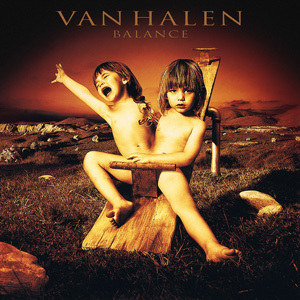 Balance is the tenth studio album by American hard rock band Van Halen, released on January 24, 1995 by Warner Bros. Records. The album is the last of the band's four studio releases to feature Sammy Hagar as the lead singer. Balance reached number 1 on the U.S. Billboard 200 in February 1995 and reached Triple Platinum status on May 12, 2004 by selling more than three million copies in the U.S. "The Seventh Seal" was nominated for a Grammy for Best Hard Rock Performance. Montrose was a California-based hard rock band. The band originally featured Ronnie Montrose on guitar and future solo artist and Van Halen frontman Sammy Hagar. Rounding out the original foursome were bassist Bill Church and drummer Denny Carmassi. Hagar Schon Aaronson Shrieve was a supergroup band featuring lead vocalist Sammy Hagar, lead guitarist Neal Schon, bassist Kenny Aaronson and drummer Michael Shrieve. The group reportedly rehearsed for less than a month before playing in concert. They released a semi-live album, recorded during two live performances at The Warfield in San Francisco, entitled Through the Fire. The album includes a cover of Procol Harum's "A Whiter Shade of Pale". Texxas Jam was the informal nickname of an annual summer rock concert called the Texxas World Music Festival (1978–1988). It was held in Dallas at the Cotton Bowl, and in Houston, at either the Astrodome or the Rice Stadium on the campus of Rice University. 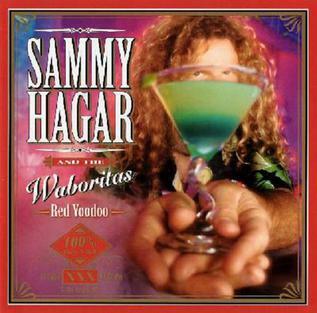 Red Voodoo is a Sammy Hagar and The Waboritas album. When Hagar finished touring in support of his Marching To Mars album, he recorded this record. Red Voodoo is really an extension of the party atmosphere that permeated Hagar's concerts on that tour and this album has that whimsical party vibe. "Mas Tequila" was the lead single and it almost served as a commercial for Hagar's other career endeavor, as his Cabo Wabo tequila was being distributed throughout the United States. The cover of this album even features a glass of Waborita that Hagar spent a portion of his concerts creating on stage during his last tour. Van Halen 2007–2008 Tour was a North American concert tour occurring in the fall of 2007 and winter and spring of 2008 for hard rock band Van Halen. It was Van Halen's first tour since 2004, and the first one with original singer David Lee Roth since he left the band in 1985. Roth was with the band from 1974–1985, when the band rose to prominence. The Van Halen Tour 2004 was a North American concert tour by hard rock band Van Halen. It was the band's first tour since 1998, and saw the return of lead singer Sammy Hagar who left the band in 1996 on bad terms. The III Tour was a 1998 concert tour by hard rock band Van Halen. It was the band's first and only tour with vocalist Gary Cherone, in support of the only album he recorded with the band, 1998's Van Halen III. The OU812 Tour was a concert tour by hard rock band Van Halen. It was the second tour to include dates in Japan, and was the second with Sammy Hagar as vocalist. It followed the Monsters of Rock Tour 1988, which had formed the first part of the promotion for the OU812 album. The 5150 Tour was a concert tour by hard rock band Van Halen. The For Unlawful Carnal Knowledge Tour was a North American concert tour by hard rock band Van Halen in support of their album For Unlawful Carnal Knowledge. It was one of the band's longer tours, divided into 99 dates. It featured shows in Hawaii and Mexico, places Van Halen rarely played in their history. The Balance Tour was a concert tour by hard rock band Van Halen promoting their album Balance. It was dubbed the "Ambulance" Tour by Eddie Van Halen due to his hip injury caused by avascular necrosis, and his brother, drummer Alex Van Halen wearing a neck brace for most of the tour, due to rupturing three vertebrae in his neck. Consequently, Eddie was a lot more static on stage. This would be the group's last tour with Sammy Hagar on vocals until 2004, when he briefly rejoined the band for a tour. The opening night in Pensacola, and a combination of footage from the two Toronto shows were broadcast on Pay-Per-View. Chickenfoot is a rock supergroup formed in 2008. The group consists of vocalist Sammy Hagar, bassist Michael Anthony, guitarist Joe Satriani, and drummer Chad Smith. Due to consistent recording and touring commitments to the Red Hot Chili Peppers, Kenny Aronoff joined the group in 2011 as a touring replacement for Smith. While the band has not formally announced a breakup, in June 2016 Smith said that he had doubts about its survival due to their busy schedules. ↑ "15 Heavy-metal fans arrested". The Bulletin . July 25, 1988. ↑ "Jason Newsted Reflects on Metallica's '...And Justice For All'". ↑ Cameron, Keith (June 2008). "Let me entertain you…". Q #263. p. 82.